Late last week the Australian Bureau of Statistics (ABS) released lending finance data for June 2016. When this data is paired with housing finance data, valuable insight is gained into mortgage lending across the states and territories. Based on this data the following was borrowed for mortgage purposes across each state and territory over the month: $14.2 billion in NSW, $9.6 billion in Vic, $5.4 billion in Qld, $1.8 billion in SA, $3.0 billion in WA, $305 million in Tas, $167 million in NT and $622 million in ACT. 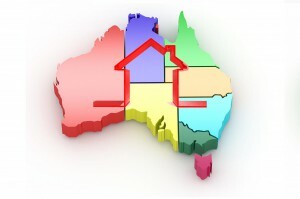 Following recent softness in mortgage finance commitments, each state and territory except Tas and ACT recorded an increase in lending over June. Based on these figures, NSW accounted for 40.4% of all mortgage lending over the month and Vic accounted for 27.4%. These two states accounted for more than two thirds of all mortgage lending in June 2016. The Department of Infrastructure and Regional Planning released their monthly domestic aviation activity data for June 2016 earlier this week. The data showed that in June, 4,608,766 passengers were carried across domestic routes which was 3.3% higher year-on-year. Ayers Rock-Sydney (+23.6%), BrisbaneHamilton Island (+17.5%), Melbourne-Sunshine Coast (+16.5%), Hobart-Sydney (+16.0%) and Brisbane-Bundaberg (+13.9%). The routes with the biggest year-on-year declines in passenger numbers were: Sydney-Townsville (-23.0%), Karratha-Perth (-16.0%), Brisbane-Gladstone (-15.5%), Brisbane-Moranbah (-15.4%) and Newman-Perth (-11.9%). The data highlights that the tourism and liftestyle trend is gathering some momentum, whilst the drop in demand for flights to and from resource regions provides further clarity about the downturn in the mining and resource regions. The Reserve Bank (RBA) released the minutes of their August board meeting this week. 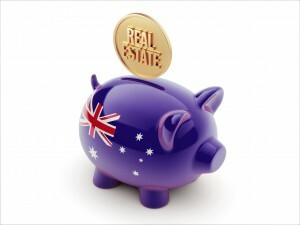 At the meeting the RBA board decided to cut official interest rates by 25 basis points to 1.5%. The board made this decision in the belief that easing monetary policy would improve the prospects of sustainable economic growth and assist with inflation returning to target over time. There were 1,471 capital city auctions over the week ending August 14 with CoreLogic collecting results for 1,353 auctions or 92% of all auctions. 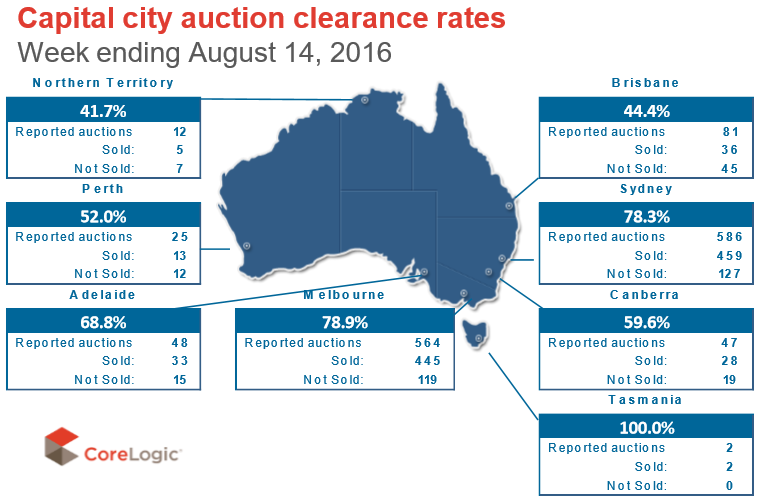 Over the week the combined capital city clearance rate was recorded at 75.0%, up from 72.5% across 1,540 auctions the previous week. The 75.0% clearance rate was the highest since the week ending 9 August 2015. 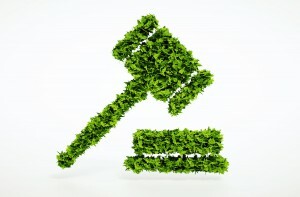 Last week, across Melbourne, 605 auctions were held with a clearance rate of 78.9%. While the number of auctions was down from 724 over the previous week, it was Melbourne’s highest clearance rate since the week ended 21 July 2015. Sydney’s auction clearance rate was recorded at 78.3% across 635 auctions with the clearance rate up from 77.5% across 544 auctions over the previous week. It was the city’s highest clearance rate in six weeks. Sydney’s auction clearance rate has been above 70% for 17 consecutive weeks while last week was the sixth consecutive week clearance rates have been above 70% in Melbourne. Relative to the same period last year, the number of new listings over the past twenty eight days were -4.7% lower on a national basis and the total volume of stock on the market was -2.0% lower. Across the combined capital cities, trends are slightly different with new listings -7.7% lower relative to last year, while total listings are 3.5% higher. On a city-by-city basis, Brisbane (+5.5%), Perth (+6.2%), Hobart (+18.4%) and Canberra (+6.8%) have a higher number of new listings currently relative to a year ago. 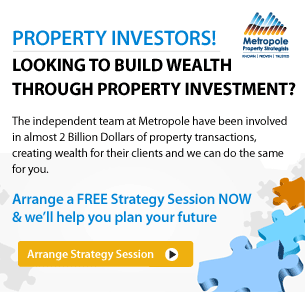 In terms of the total stock available for sale, Melbourne (-2.4%), Hobart (-30.3%) and Canberra (-6.3%) are the only capital cities to have fewer total properties for sale than a year ago. The number of new properties listed for sale has continued to trend higher over the past week while the total number of homes listed for sale is relatively unchanged.